Superbly written . 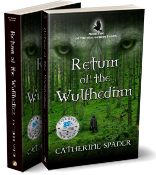 . .
“Superbly written and impeccably edited….Spader is unquestionably a talented writer: Her writing style is fluid and at times lyrical, her description of northern Germany meticulous and fully immersive, and her knowledge of folklore extensive.